In the midst of all the busyness of life lately, I squeezed in a noon time Advent service at a lovely church a few towns over. I had to laugh...I am pretty sure I lowered the average age of the people attending by about 30 years or so, but the service itself was really nice. 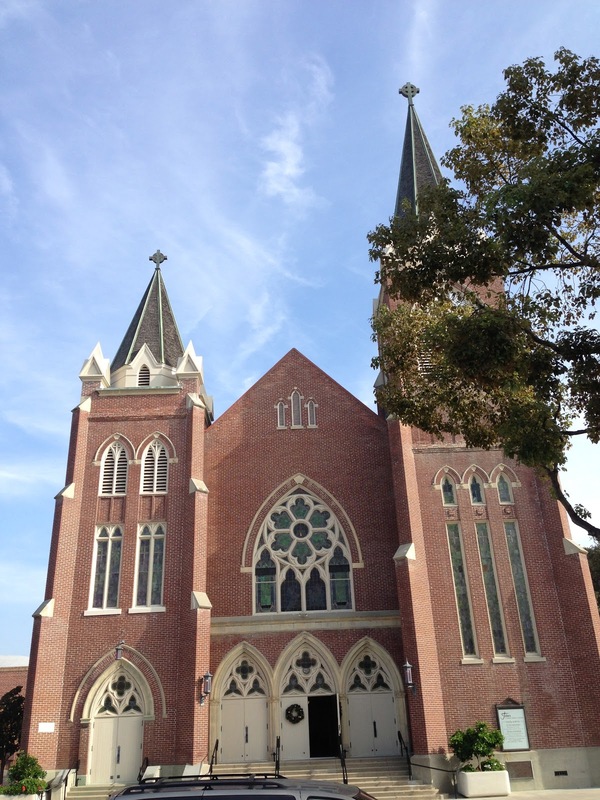 Hymns on the organ, hard wooden pews and a pretty good sermon...it just reset my brain to where it needed to be. The town of Orange, California is super sweet and full of small town charm. Christmas time is one of my favorite times to go hang out there...plus, they have great restaurants and antique shops. Win, win. I love that in the middle of 'the circle' there is a nativity scene set up. Jesus...in public? How cool is that! 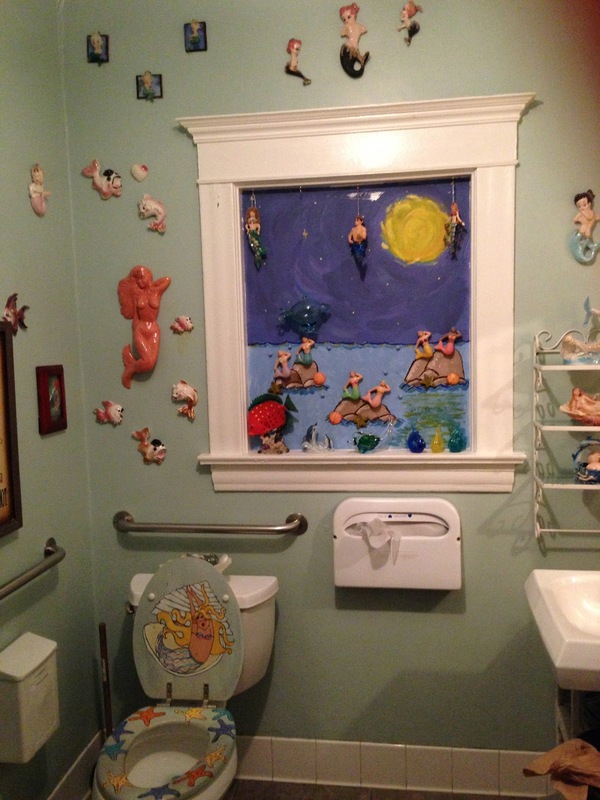 I met a girlfriend for lunch at a fun organic place with GREAT salads...the bathroom is, ummmm, quaint. Someone likes mermaids. A lot. Personally they made me slightly uncomfortable...like they were watching me, well, you know. I'm antsy and in need of a project. A low budget project. I'll let you know once I figure out exactly what that low budget project is because I have yet to figure it out. An experiment for goody bags that didn't work but were still gobbled up by my boys. Oh well...on to the next recipe. My neighbor came over and laughed at our front door. 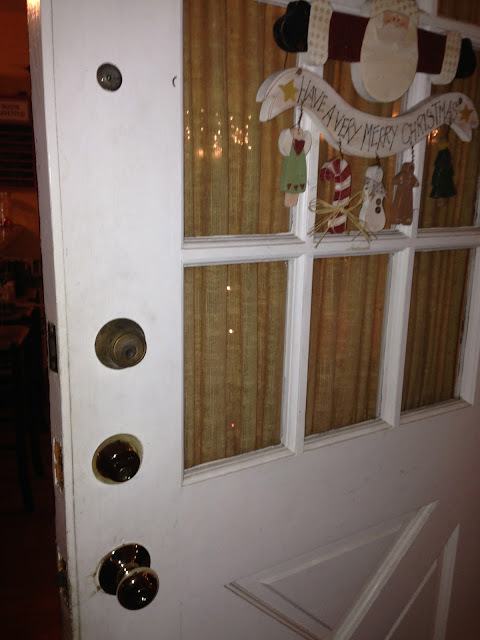 Apparently the former owners were slightly paranoid...three locks and a peep hole. Oh, and a big window. Like, who would put a peep hole next to a window???? Them: Merry Christmas, Michele. This is Santa...and Santa has heard that you have been very, very patient. Them: Well, because you've worked so hard and have been so good, Santa has brought you a present. And it has 4 wheels! Two hours later and I have a new work car. When I picked it up it only had 26 miles on it and I seriously think I am in love. Windows that go down (and up again), a working radio (satellite radio, even!) and a lovely new car smell. Not to mention the free factor, including free gas. I am overwhelmed. And thankful. So, that's my week in a nut shell. This weekend? Packed...but packed with fun stuff, like basketball and parties and concerts. Plus, the bubbly is chilling!